To received additional information after reviewing the CSOM Catalog or to schedule an auditon, please complete the Community School of Music Inquiry Form. 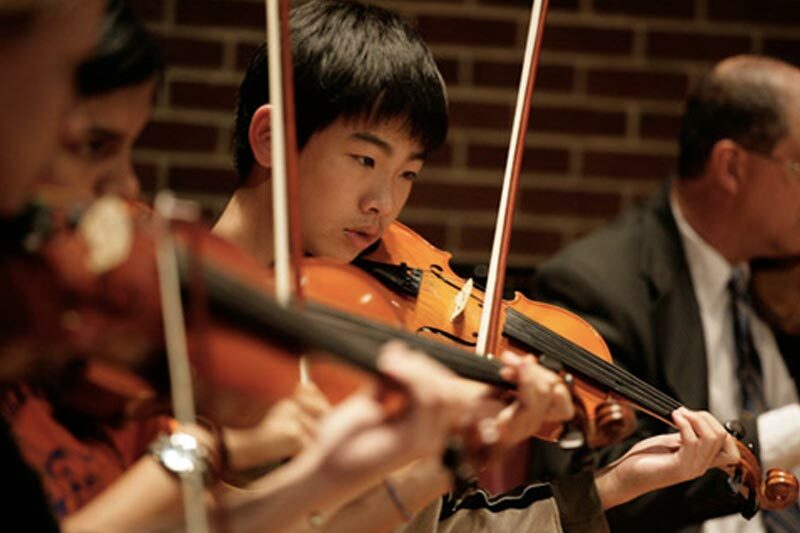 The mission of the Community School of Music (CSOM) is to offer to aspiring music students an environment in which our performing and teaching faculty can help all students reach their full potential. This includes students who might wish to pursue careers in music as well as those who might wish to develop competent levels of skills to become life-long music enthusiasts, those who will simply play or sing to fulfill their own personal needs, or who might become important members of society’s concert audience. The CSOM is open for students of all levels from beginner through post-baccalaureate. Study will include private lessons, classes, performance opportunities, competition preparation, and stimulating concerts. Through development of both the discipline and the joy of music, students of all ages will gain knowledge, skills, and musical understanding that will enrich their lives forever. Prospective students in the Community School of Music should schedule an interview and an audition during the semester prior to beginning lessons. New registrations should include a Registration Form, Vehicle Registration Form, and payment. The Community School of Music has changed the registration process to an online form. Please use these links to register for lessons. CSOM 2018-2019 Online Vehicle Registration form.